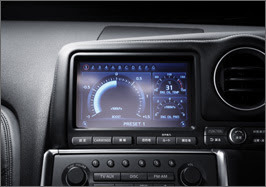 The advanced navigation system on the new NISSAN GT-R - which uses the same screen as the innovative multi-function meter - is easy to operate and uses a powerful 30 GB hard disk drive speeding route searches and enhancing driving directions. In addition to its navigation function, it also includes an enriched entertainment system capable of recording up to 3000 songs (from music imported from CDs) as well as playing DVDs. The high resolution screen with newly developed WVGA (wide video graphics array) high resolution display is a liquid crystal monitor that has four times the number of pixels of a conventional satellite navigation screen. Innovative 3D graphics can depict streetscapes and junctions with far more accuracy than conventional displays. The system is also easy to use thanks to both a navigation switch and a touchpad. There is also voice command and a steering wheel switch. The powerful 30GB system also allows for a superb entertainment system. It can record up to 3000 songs from music CDs and provides various music selection functions including the selection of songs by mood including 'bright' and 'soothing'. It can play DVD audio and video and can play music from memory CF cards, WMA (Windows Media Audio) and MP3 format. By using a Bluetooth® transmitter, you can wirelessly connect and listen to music on an iPod® . Wireless connection also allows hands-free cellular phone calls. A digital TV tuner allows drivers and passengers to watch TV on the high definition screen.